Categorías Gourmet Gift. The Iberico Bellota Ham, pure Pata Negra. , Iberico Acorn fed Ham, pure Pata Negra. One of the most important Christmas traditions is to give and receive gifts, this custom reminds us the gifts the Three Wise Men gave to baby Jesus: gold, incense and myrrh. Incense was used as a ritual perfume in Jewish cult, and as gift showed the divinity of Jesus. Gold is associated with kings, and Christians believe Jesus Christ is the King of kings. Myrrh was a perfume used for embalming corpses to prevent decomposition giving them a nicer aroma, and as gift symbolized Jesus would suffer and die. Anywhere family and friends give away gifts especially on Christmas time. It is the time of Christmas gift baskets and corporate gifts ! All companies try to find the best, the most original and the most exclusive corporate gift to signal their customers and supplier how important they are for the company moreover in so special days. This way the company can show its interest, gratitude, tighten their trade ties and foster fidelity towards our company and our Brand. Our gift will represent our company, the customer will remember us through it and in some way it will mark our future business relationship. Therefore the corporate gift or company gift should be original, elegant, possess an excellent design and should please the customer. Which product do our customers and workers hope to receive? A ham but not any ham, a real Iberico Ham, acorn-fed Iberico ham if it is possible. Acorn-fed Iberico ham is the corporate gift par excellence, it is King of any Christmas gift basket or any corporate gift. Iberico ham is a must gift on Christmas! But as a corporate gift we cannot personalize it. How can we personalize a ham? Jamonify got the solution for ham personalization, the best acorn-fed Iberico ham for your corporate gift suitable for any Christmas food hamper, knife cut by expert artisans and packed in luxury packaging. All formats are produced in a luxury packaging that can be personalized. This way the company can offer its best image and originality, giving away an exquisite gourmet food product. Ham as gift with a personalized packaging, knife cut fresh and ready to be eaten. We should avoid the average corporative customization and show this product type, ham or ham shoulder in a simple but elegant way. The main reason is the remembrance of the company but avoiding it to become direct advertising. We should think on the people who are getting our food hampers, know what they like and if the gift fits the occasion. 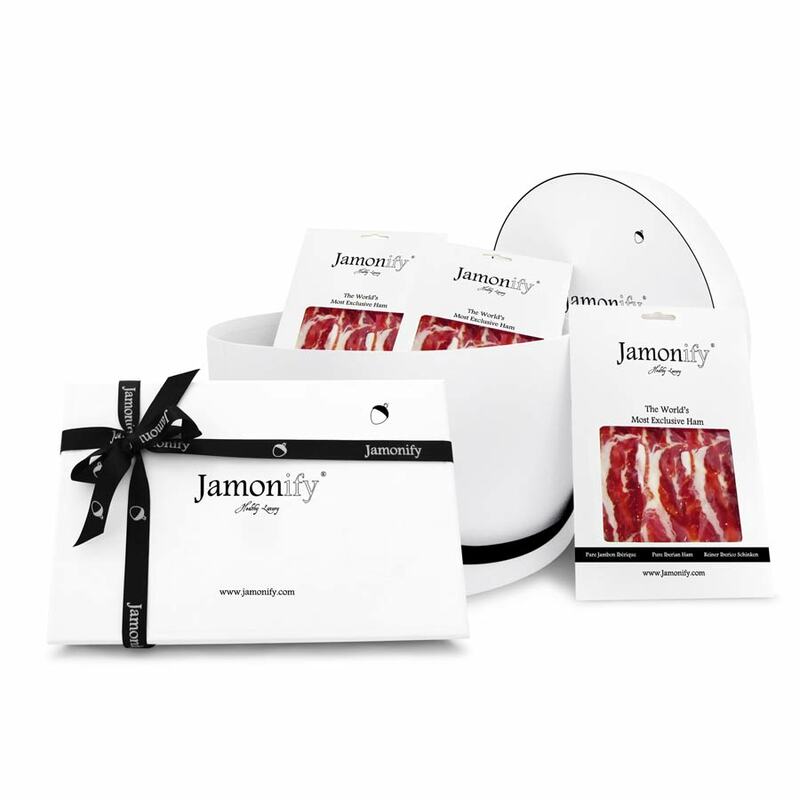 And Christmas is the perfect occasion for ham, Iberico ham to give away, the perfect corporate gift spectacularly packed by Jamonify. A corporate gift that includes the delicious Iberico ham not only will impress your clients and associates but it will make their Christmas holidays an unforgettable gourmet experience. Giving ways gifts packed in a special original way is the best opportunity to get closer to your customers and remind them who and where your company is. Gift and Ham are concepts that match perfectly well on Christmas season, therefore GIVE AWAY HAM, give away Jamonify, and you will hit the target.